The cities of the future are massive, sprawling, beautiful monsters, covering entire coastlines — and in some cases, entire continents. Whether it's Judge Dredd's Mega-Cities or William Gibson's "Sprawl," future cities always devour land. 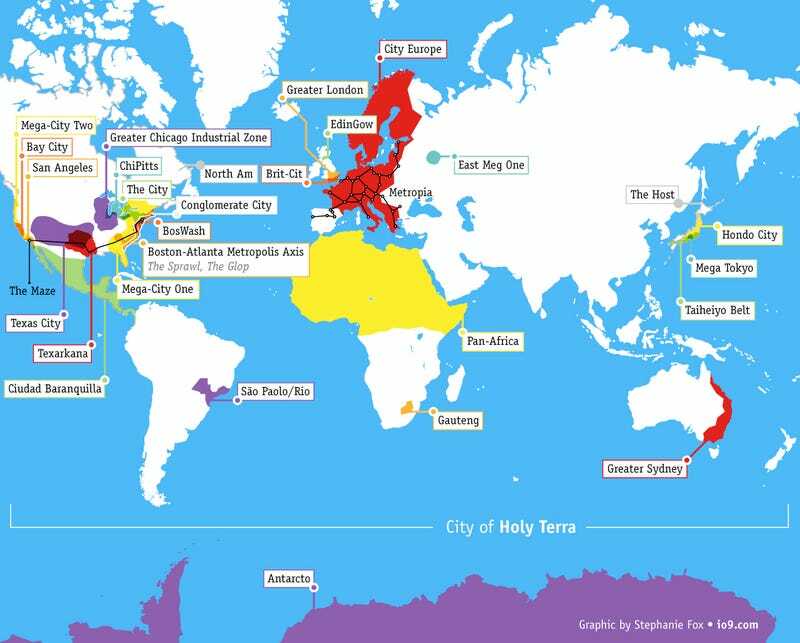 Here's a map of future megalopolises. The city of North Am (in Magnus Robot Fighter) does just what it sounds like — it covers almost the entirety of North America, giving you lots and lots of space in which to (what else?) fight robots. The Maze is a huge network of underground parking garages that stretches all the way from New York to Los Angeles, in the movie Circuitry Man. Lots and lots of SF stories predict a huge swathe of city stretching along the East Coast of the United States. One of the most famous is Judge Dredd's Mega-City One, which eventually stretches all the way down to Florida. In Neuromancer and other books by William Gibson, a mega-city stretching from Boston to Atlanta is known as the Boston-Atlanta Metropolitan Axis (BAMA) or The Sprawl. In He, She And It by Marge Piercy, the urban megalopolis that stretches from the former Boston to the former Atlanta is called The Glop. And similarly, in the novel The Rise Of The Conglomerates by Thomas Nevins, a huge sprawling "Conglomerate City" occupies most of the East Coast of the United States. There's also BosWash, the city that stretches from Manchester, NH to Virginia Beach, Virginia. It was first predicted in the 1961 book Megalopolis: The Urbanized Northeastern Seaboard of the United States by Jean Gottman. The City in Transmetropolitan is commonly believed to be a megacity including New York and stretching as far West as the Great Lakes, which are referred to as its Western lakes. The Greater Chicago Industrial Zone: In Halo, the former city of Chicago now covers the former states of Illinois, Wisconsin, Indiana. And Chicago is no longer really part of the United States — the people in this city-state consider thesmelves citizens of the United Nations. In real life, some urban planners talk about an area called ChiPitts, which comprises Chicago and Pittsburgh, and everything in between. Texas City, in the Judge Dredd comic, covers a huge area of the former Southwest — including Texas, of course. Bay City is a massive conurbation covering San Francisco as well as its outlying areas, in Richard K. Morgan's Altered Carbon. San Angeles appears in many different works of fiction, and it usually encompasses Los Angeles, San Diego and sometimes Santa Barbara. It's the setting for Demolition Man. Mega-City Two also accounts for five thousand miles of California coastline — or it did, until it was nuked — in the Judge Dredd comic. Sao Paulo/Rio: In Ben Bova's Mars, the rural poor stream into the cities of Sao Paolo and Rio De Janeiro in such huge numbers, the two cities grow into "a single urban megacity more than three hundred kilometers wide, that stretched from the beaches to the inland hills, sparkling high-rise towers for the rich, sprawling filthy slums for the poor, and smoggy lung-corroding pollution for all." Ciudad Baranquilla, aka Banana City, is the mega city that covers most of Central America in the Judge Dredd comics. Greater London — in Sunstorm by Arthur C. Clarke and Stephen Baxter, London has grown outwards massively, swallowing up tons of villages and formerly independent towns. Clarke and Baxter describe London as spreading out, "kilometer upon kilometer of houses and factories... the scattered, helpless city that lay helpless below" a passing airplane. Edinburgh/Glasgow — it's not strictly speaking science fiction, but there's a lot of talk about these two Scottish cities combining into one megalopolis in the coming century. The two cities could soon be linked by a high-speed maglev train. But it doesn't appear that any science fiction authors have written about EdinGow yet. Metropia, in the animated film of the same name, is a massive network of subway systems and "undergrounds" linking all the cities in continental Europe. The world is running out of oil, so the leaders come up with the plan to link all of the subway systems into one huge network — which appears to be haunted. City Europe, in the Chung Kuo series by David Wingrove, covers an enormous area of continental Europe, from Scandinavia to the Mediterranean. The city is made up of a series of "stacks" with the richest people living on the top levels and the poorest down in the wastelands below. The south of England is occupied by Brit-Cit in Judge Dredd. Plus East Meg One is another mega-city in the Judge Dredd universe, which covers a big chunk of the former Soviet Union, including Moscow. And of course, there's East-Meg One, the Soviet mega-city in Judge Dredd, which sprawls around the remains of Moscow — until it gets destroyed in a war with Mega-City One. Pan-Africa is a continent-wide quasi-state comprising several mega-cities in the Judge Dredd universe: they include Umar (the former Libya), Simba City (Cameroon), Luxor (Egypt), New Jerusalem (the northeast of Ethiopia), and Casablanca. Gauteng is another one that doesn't appear to have popped up in science fiction very much, but it's talked about a lot in real life. In a nutshell, Johannesburg (a city already growing way past its capacity) joins up with Pretoria/Tshwane and a number of other municipalities, to form a single megacity. There are already plans to join them via a high-speed "Gautrain." Mega-Tokyo in Bubblegum Crisis. An earthquake splits Tokyo in two, and as the city rebuilds, it gets even larger and much more sprawling, coming to be known as Mega Tokyo. Here's a map of Mega Tokyo, from B-Club Special (via Igarashi) Likewise, Akira takes place in Neo Tokyo, a sprawling metropolis of steel and neon. And the anime Cyber-City Oedo 808 takes place in a fictional future "Edo," or Tokyo, which is apparently much larger than the existing city. And real-life urban planners talk about the Taiheiyo Belt, which will cover the Pacific coast of Japan including Tokyo, Osaka and Nagoya. A single continuous robotic structure known as The Host covers almost all the islands of Japan, and 50 million people live inside it, in Magnus Robot Fighter and Rai. And of course, Judge Dredd does not leave Asia untouched — Hondo City covers most of Japan, from Hokkaido all the way down to Wakayama. Greater Sydney is predicted to encompass a region spanning from Melbourne, all the way up to Queensland along the coast. But as with Edinburgh/Glasgow and Gauteng, it doesn't appear that anybody's written science fiction about this megalopolis yet. A continent-wide city called Antarcto covers the whole of the Antarctic, in Magnus, Robot Fighter. Because robot-fighting is best served... cold. And of course, the city of Holy Terra, or just Terra, occupies almost the entire planet's surface in Warhammer 40,000. Additional reporting by Alexis Brown. Map layout by Stephanie Fox. A version of this article originally appeared in 2009.